Samsung unveiled its first “The Wall” MicroLED TV at CES last year. It was massive, measuring in at 146-inch, with self-emitting MicroLEDs that are smaller than existing LEDs. It’s a modular setup so users can customize the TV’s shape and size as per their preferences. That size wasn’t really meant for the home, though, so Samsung only sold it to businesses last year. It did say that a consumer version of The Wall will be launched in 2019. It has shown off a much more reasonable 75-inch The Wall TV ahead of CES 2019 in Las Vegas. 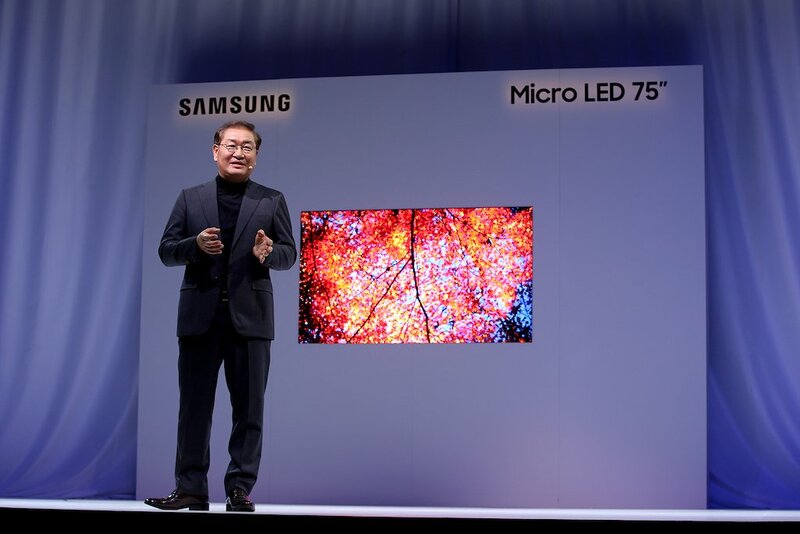 Technical advancements have enabled Samsung to create this modular 4K MicroLED display in a smaller and more consumer-friendly 75-inch size. The TV basically has individual modules of self-emissive MicroLEDs so users can even create irregular 9×3, 1×7 or 5×1 screen sizes if they so desire. These displays can also optimize the content regardless of the size and shape of the screen. They can scale to increase resolution while keeping the pixel density constant. So they don’t break a sweat while supporting standard 16:9 to 21:9 aspect ratios and unconventional aspect ratios like 32:9 and 1:1 without any compromise in picture quality. Since there are no bezels between the modules, The Wall displays are completely bezel-free. This provides for an impressive, infinity pool effect which enables the display to blend into any living environment. Samsung has even shown off a 219-inch form factor today which would obviously be better suited for businesses. The company hasn’t said when the consumer version will go on sale and how much it will cost. You can bet it will cost a pretty penny. Can I use The Wall as a computer monitor? Where are all the cables and connections ? Where’s motherboard ? I believe that like on my TV there is just one clear fiber optic cable coming from the TV down to a control box. It is very good. One cable that you cannot see unless you look very closely. It ‘s very cool! In the control box there is everything, power, hdmi ports, usb ports etc. It’s very tidy. Yes, my TVs are the same. Just one cable. I imagine probably LG have this too. It’s been around I think for about 2 years now.